Next: Yamaha MT-09: 3-cylinders for all, finally! That is there, Yamaha raises finally the veil on its two motorcycles of Cross-country race 2014. 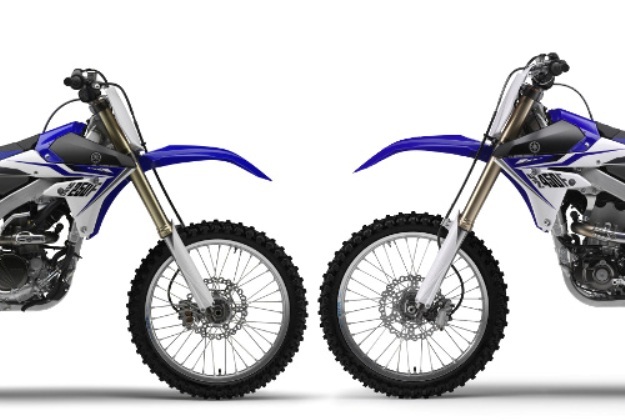 As one could expect it, there is the new one on the YZ-F with a Yamaha YZ450F which evolves rather significantly and a new Yamaha YZ250F which follow the traces of his/her big sister with a very new engine reversed and injected and a deeply re-examined frame. All that it is necessary to know about these innovations is already on bikesdoctor! As we announced it to you a few times ago, there is the new one in the range Yamaha 4-time Cross-country race 2014. 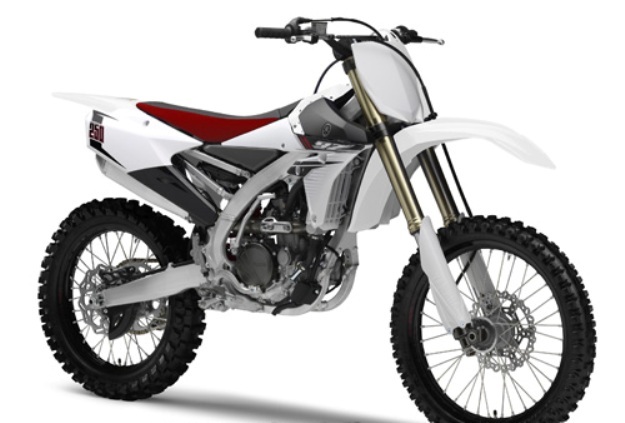 It is from now on official; the brand with the tuning forks just has just revealed its YZ-F 2014. 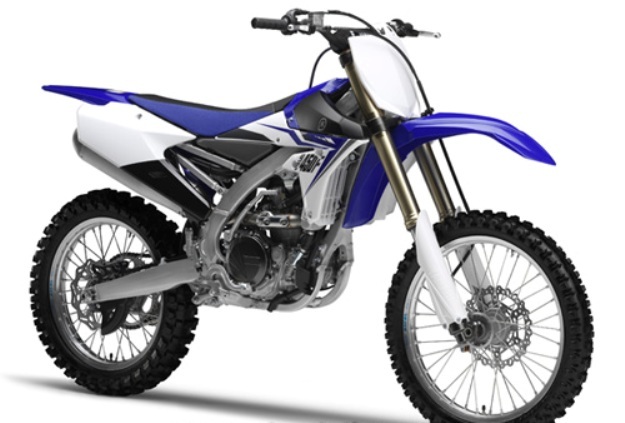 Yamaha YZ450F evolves significantly for the first time since 2009 and the arrival of its new concept of engine reversed and inclined backwards, while the Yamaha YZ250F changes finally its engine and is copied on the mechanical design of its elder with a new frame. Here the first information on these innovations 2014. On the traces of the YZ450F! The small YZ-F thus adopts in 2014 an engine technically very near to that of the 450 and leaves side its good old man one-cylinder 4-time and 5 valves supplied with a carburetor. 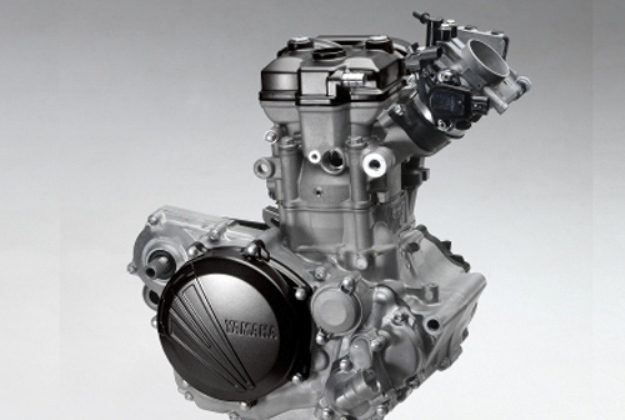 However, Yamaha 250 YZ-F has components which are clean for him: new cylinder head, piston, conduit of admission and exhaust larger, mechanism of valves and chock of lighting thanks to a lighter casing. The Yamaha YZ450F is characterized by its one-cylinder 4-time of 450 cm ³ to injection and liquid cooling, 4 valves, two ACT, tilted backwards. In its version 2014, Yamaha put on a motorcycle easier to control. The valves are from now on larger, the electronic control unit (ECU) receives a new configuration and the ratios transmission is modified in order to obtain an exploitable couple. The conduits of admission and exhaust, the profiles of cams and the reports of crankshaft were re-examined. With an aim of gaining in weight, dimensions of the casing were reduced and the simplified systems of lubrication (wet casing). The petrol station is also more compact. The new collector curves around the engine. This design introduced by the official TEAM Yamaha Monster Renaldo allows one to lengthen the collector higher and to shorten the silencer to center the masses. Side clutch, the Yamaha YZ250F is equipped with a new box coupled to a more flexible clutch. Yamaha YZ450F sees its optimized clutch disks and receives new specifications for its drive shaft and its pinions primary education and secondary. For the two YZ, the case Yamaha Power Tuner allows to quickly personalize the configuration of the engine to adapt it to the various styles of piloting and profiles of ground. 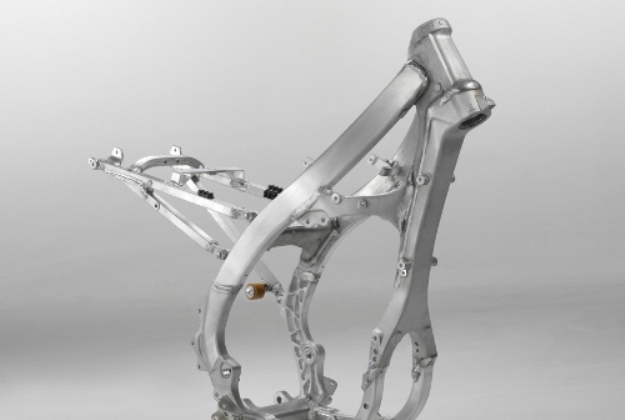 The framework of the 250 and 450 YZ-F are of similar design, but that of the 250 is adapted to dimensions of the motorcycle. This hydro formed framework with bilateral beam consists of ten forged, molded and extruded aluminum parts. A new radiator, finer and shorter, as well as a loop postpones shorter and several components lighter contribute to the reduction of the weight. The reversed forks Kayaba with cartridge separate air-liquid receive new springs. The front wheel axle passes to a higher diameter (22 mm), the t-pieces and trigger guards were rigidifies. A new shock absorber makes its appearance, marking the return to a vertical bottle undoubtedly less exposed to the heat of the collector and engine that on the models former. This shock absorber installation of is made possible thanks to the new collector, which makes from now on the full rotation of the engine. That made it possible to lower the tank while increasing its capacity of one liter, to bring closer the system to injection and to adopt a new electrical loom. All which changes Strongly Contribute to the centering of the masses on the YZ-F. 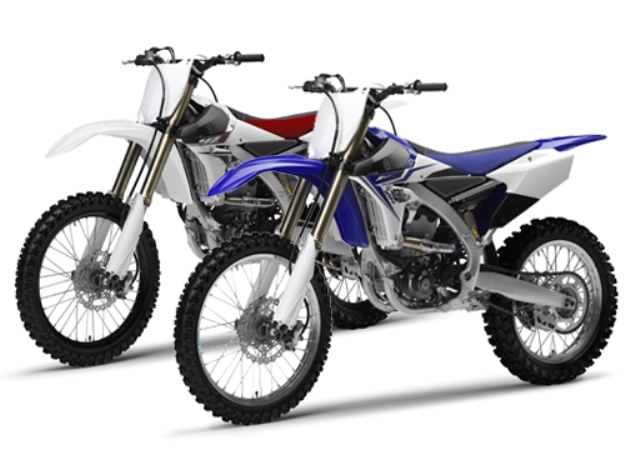 The esthetics and the total line of range Yamaha YZ-F 2014 were revisited. Yamaha wanted “to hide” the reserve of 7.5 liters in the motorcycle so that it disappears visually. The access to the air filter wants to be easy in order to simplify maintenance all the same. The saddle and the mudguard postpone were restructured on the models 2014, and the air intake is from now on prominent on the new silhouette. The news deco is directly integrated in the plastics in order to increase its wear resistance. Finally Yamaha will be always available in Racing Blue or Sports White. 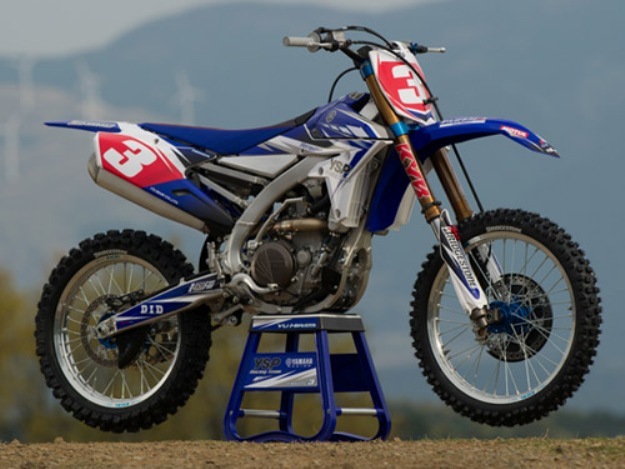 Here for the news Yamaha YZ250F and YZ450F 2014: next stage the test on bikesdoctor: stay tuned!